We’ve had major setbacks the last few years and have utterly disappointed our backers and ourselves. We’ve had a consecutive string of bad luck and bad decisions. And by our own fault, we left the reigns of our games and path of our company to be steered by everyone but ourselves. It’s time for a change in the right direction. In a few weeks, we’ll be making an official announcement of our new goals, schedule, and progress for 2017. It’s been a long time coming and finally we can pick ourselves up from the ground, stand up and take that first solid step to a brighter future. This year, we will rise again. In preparation for Q3 this year, we’re starting to revamp all of our websites. It’s going to be a long a rigorous process but well worth it. Currently, we have the most updated rules in our Gameplay section under Fairytale Games: Battle Royale. As well, we’ve updated the Super Fairytale Fighters 2 rules on its respective page. We’ll be updating all of the miniatures pages with actual photos of them as well as cards from the game in a more innovative gallery section. So keep on coming back as we’re bound to show you something new! In the meantime, here’s the unboxing of Fairytale Games: Battle Royale if you missed it the first time. This is just a super quick update. For Battle Royale, we updated the box/components a few times and wanted to share with you kind of the behind the scenes look at what gets approved before the printing. The following are what they call “White Samples”, meaning blank cards and boxes created to show the structure and placement of the box and where components go within the box. At first glance it’s a bit mundane, but what we really get out of it, is a tactile feel for the paper stock as well as to see if things fit the way they should. This version is the third trial we had shipped back and forth to us. Each tweak has improved the design and from our last iteration, I believe it’s good to go. Since we took this photo, we’ve added a wider insert so cards will fit sleeved as well as the box material is a bit sturdier to hold all 475 cards and the character boards! Because of time constraints, our next proofs will be e-proofs, then upon approval we’ll have our Hard Proofs (manufacture print proof), which is basically a final copy in our hands. I’m looking so much forward to showing those to you when they come in! Looking forward to the next update with you all! Hi Everyone! Although we’ve been answering questions in our comment thread, I wanted to update you here as well in regards to the shipping of the Sacred40 minis. Per our last update, we had sent everything to our shipping agency. We understood that there was a line and we were in their queue, but we did not fathom just how long we’d be in that line. Apparently, because of the port strikes causing everything to bottleneck, many companies (not just in gaming) sought out shipping companies to help them make up for lost time, giving a lot of the “big” companies a chance to cut in line. The good news is, we just heard from our Shipping company on Tuesday and they told us that by next week, we can finally get some packages out the door. Finally. I’m really sorry for the delay but I was actually in the same position as you all, wondering what the hold up was. Needless to say, our continuous pestering may have allowed us to get ahead of some people… at least that’s what they told us. Anyway, when you start receiving your miniatures, please let us know! HOW DOES THIS EFFECT INTERNATIONAL BACKERS? When our Sacred 40s arrived in our warehouse back during GAMMA, we had the shipping company send a specific quantity to EU, AU and CAN. From our understanding they already did this, though only 2 weeks ago. Once these cases reach their distribution centers, they will be distributed to the backers in the respective countries. ARE WE STILL ON TRACK WITH BATTLE ROYALE? Yes we are! Per our manufacture, it will be ready by the time of GenCon. In other words, we’ll begin fulfillment of Battle Royale at that time before we get to GenCon. Those who demo Battle Royale at GenCon will be playing on the actual “hot off the presses” game! WHAT’S THE PLAN FOR GENCON? We will be sharing the booth with our friends at Greenbrier Games. The booth number this year will be Booth#2437. We’ll have a ton of demos between both companies, including Fairytale Games: Battle Royale, Dragon Tides, and Martial Arts: The Card Game. We’re excited to see you there! This year, we’ll not only have a special raffle, but a special promo as well. Of course, for those who aren’t able to attend GenCon, you’ll also receive the same promo in one of our shipment waves as we have a “No Backer Left Behind” policy with promotional items. This said, we have GenCon events open that you can sign up for. Go to www.gencon.com and search for Fairytale Games: Battle Royale and Dragon Tides. If the event you want is blocked out already, we’ll also have rotating demos in our booth. A long while ago we uploaded a Beta PNP (Print and Play) version of Rumplestiltskin, our Fairytale Games version of the popular Werewolf and Mafia games… with a twist. But it occurred to me later that several of you never got a chance to check out the artwork or just didn’t see the download link previously. Here’s a sample of just some of the artwork in Rumplestiltskin and our artist’s rendition of the characters in our Fairytale Games Universe. Enjoy! Now that the Sacred40 Shipping will be out of our hands, Melissa will contact the remaining backers who are expecting refunds (from requesting refunds in October 2014 and not after). As well, abandoned pledges that were picked up will be paid back to the backer who abandoned their pledge. Keep in mind, this is ONLY for pledges that have been picked up (abandoned pledges have a backer ID code in our admin system in order for us to identify whose pledge it was.) The timeline for this will be within this month. Please contact Melissa@artisticjustice.com if you have any questions, keeping in mind that our Kickstarter threads is not the best place for these types of inquiries. Super Fairytale Fighters 2: Round Two! No knowing that the shipping list took so much time, we will now have the time to whip out some great previews of this spin-off game. In the next update, you’ll get to see the rules, gameplay video, and even possibly…. your very own PNP?!?! Ok, let’s not get ahead of ourselves. For your patience, here’s a teaser of the type of cards that make up a deck. As you can tell, these are from Robin Hood’s deck. In each character’s deck, there is a possible combination of Attack Moves, Defense Moves, Strategy Moves, and Event Cards. A deck consists of 50 cards with a varying number of each card, depending on a deck’s playing style. Robin Hood is fairly quick, with a bit of unpredictability since his trick arrows are meant to confuse and offer unexpected abilities. Of course, he is one of the few characters who cannot rely on combos because of the nature of his fighting style. Let’s learn more about him in the next update! A Quick Update…. plus exciting news! Hi Everyone! Getting back from a very successful trip to GAMA, we have exciting news for you. First off, for this campaign specifically, we’re still in the tooling phase for the last 3 box sets. We’re hitting a very busy time for production overseas so things are a bit backed up at the manufacture. Things should clear up in the pipeline over there soon, letting us give you updates of the last group of manufacture proofs when they come in. Following, we’ll get an official notice as to how long the minis will need for production. We’re looking forward to a Fall Fulfillment for these minis and more. For the literature content, J.L.Clark is working hard on the Storybook as well as helping us supervise some of our other book related add-ons. So, anyone with address updates please send them to noelia@artisticjustice.com as we will be fulfilling Wave1: The Sacred40 in about a week! As well, if you happen across any abandoned pledges in our online store (www.artisticjusticegames.com/shop) and grab it before April 8th, if it has the Sacred40 in it, we’ll be sending out your copy as well. I know we keep flooding the threads about the Sacred40 minis recently, but after we begin fulfillment, rest assured we’ll be focused on the other items of this campaign again. We’re just very excited about getting items in our warehouse and at the very least, sending them out first. With so many things coming, we hope to bring more of the Fairytale Games Universe to you at a quicker pace this year. Some sample paints that are very talented artist has done. Enjoy! The Sacred 40 Minis are Here! I want more info on the games! Now that the minis are in and will soon be on its way, the updates will be completely focused on the games and spinoffs. Battle Royale is complete and all edits have been made (fingers crossed….please….). So it looks like manufacturing will start very soon and is in our printer’s queue. I’ve given all the green lights as I can so I’m at their mercy. But with whatever updates I have, I’ll be diligent in letting you all know. We are still shooting for having them by GenCon though it will be very close. I’m hoping they will be in by then so that backers who attend can go ahead and pick them up. Next, I want to briefly go over the other editions of the game. Though we started this campaign with the intentions of having Zombie Edition be the only other edition and be merely an art swap, these editions have turned into something completely new. We’ve glossed over them before but to give you a little insight, here’s some details. HORROR EDITION: In this iteration, since the storyline follows the conclusion of Battle Royale, think of this as less of a “survival of the fittest”, rather a more teamwork-ish game since several players will have to work together to open doors and unlock mysteries that will summon the dark side over. There will be many boss battles and creatures that plague the lands. There is a FEAR meter that will either help you by giving you needed adrenaline bursts, or might tip you over to become insane. STEAMPUNK EDITION: In this edition, the game concentrates on Guilds (you will build a guild among players and/or characters in the beginning of the game). There’s a slight Euro feel in managing resources within your guild as different characters bring in different skills that will help you forge new weapons, technologies, or harness powerful arcane magic. During the game, there will be different classes that clash while the Spyder Organization tries to control the government, The Arcane tries to destroy technology in place of magic, and a rise of a mysterious character threatening to destroy everything. ZOMBIE EDITION: This is a pure survival game. You’ll be too busy trying to run, scavenge, find allies quickly to worry about betrayal and strategic power plays. Familiar locations and characters from Battle Royale can be cleansed or infected as your goal is to find a universal cure or get the heck out before being swarmed by walking death. This edition has a lot of synergy with Battle Royale though works well either way. And of course, we’ll be getting into more details of each edition as we start fulfilling Battle Royale. As I mentioned before, the next main goal is to re-introduce Super Fairytale Fighters 2 to you all so you can see the updated rules and learn how to play. That will be in the next update! Really, I couldn’t think of something snappy or funny to introduce this but… The Sacred40 are on a boat and heading to us! From what we understand, they will arrive at our warehouse in the middle of March. Obviously, we’re at the edge of our seats just as you and we’ll keep you updated as we find out more. But all the greens and greys will be arriving VERY soon! Of course any outstanding refund or abandoned pledges will be taken care of before that time. Any address changes, please send an e-mail to: noelia@artisticjustice.com with the subject title “Address Change”. You KNOW I had to say that. Anyway, some of you had asked about the Kickstarter Exclusive Greens. So what kind of green made the cut? Let’s take a look! As you can see, we started off with an interesting and quite accidental “Hunter Green”. Following we tweaked the PMS colors and ended up with a very refreshing “Minty Green”. Eventually, we toned down the brightness to make it much closer to what was voted on, which was a subtle Kickstarter Green (one of the original Kickstarter green color swatches) that still had elements of grey to it. We wanted it to look special for backers and not give a “deer in the headlights” feel. Since our last update, we’ve updated the google doc with a more concise schedule. As we get closer to meeting deliverables, you’ll start seeing specific dates. Currently, we are rushing final print production asset and component corrections to our Manufacture this Friday for Battle Royale. If we make it, then we will be estimating that Battle Royale will arrive sometime in July (depending on the Lunar New Year manufacture holidays). What that essentially means, is that our goal is to have them in our warehouse and start fulfillment of Battle Royale before GenCon. If this can happen, we will also be able to offer GenCon pick up of the game and any other components we plan on getting ready for that time, like the Art Book, Rumplestiltskin, teaser pack, promo stuff, etc. I think a lot of our schedule will be more apparent after this week’s rush. I’ll have the Google Doc updated again soon after. So by GenCon this year, you should have Battle Royale and the Sacred 40 to play it with at the very least, though I expect more. Since releasing the Demo Kit for downloads as well as the Videos on Solo Mode (which also covers game setup and a basic walkthrough), we’ve answered a few great questions about gameplay. But one question that came up several times was about the Backstabbing and Teamwork bonuses. This was hinted at but was not included in the Demo Kit. In Battle Royale, you will acquire Kill Points when defeating bosses or other players. When you do, to also help to signify the number of points you have, you will draw a random card from either the Betrayal Deck or Alliance Deck. The cards will have a situation that if you complete it, you will get bonuses. Obviously, Betrayals harm other players while Alliance help them. What’s unique about this is that you can do it as many time you want to reap the bonuses. So not only are they tallies of your Kills, but also active bonus situations. There’s also another reason for choosing Betrayal or Alliance. Certain quests you can claim at the Dragon Inn will require specific types of Kill Points. Some items, specifically weapons can only be equipped if you are aligned as “more evil” or “more good”, which pertains to the majority of Kill point types you have. Items of this sort will of course be more powerful. After the immediate deliverables, we’ll be finishing up some videos that will highlight a 3-4 player game as well as Super Fairytale Fighters 2. Once the Sacred40 minis are in, we’ll also produce a video to cover each of the minis and post it on BGG. 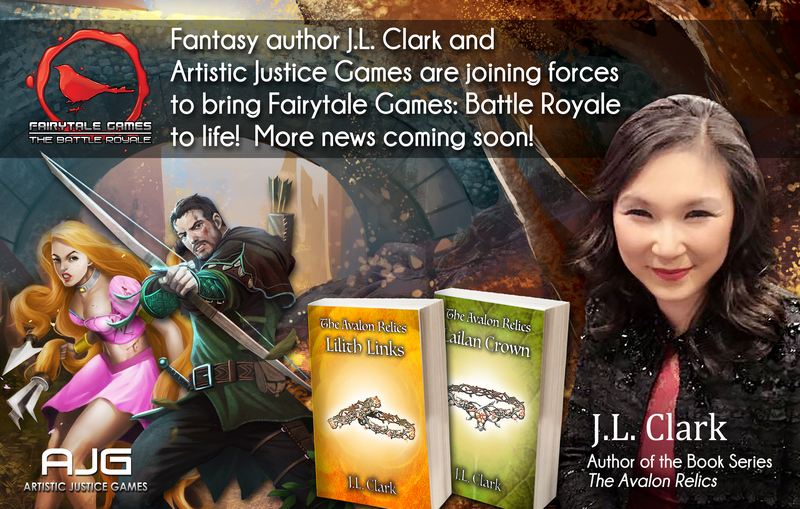 Fantasy Author, J.L.Clark to Collaborate with AJG! Though just a quick teaser, the author of the book series The Avalon Relics will be collaborating with us to bring Fairytale Games: Battle Royale and its universe to life! Be introduced to the characters, lush lands, and immerse yourselves into the Trinity’s ultimate plans for recreating the realms. More details to come! To find out more about J.L.Clark and her novels, you can find her at www.jl-clark.com, Twitter@StorytellingDoc and facebook.com/theavalonrelics! As a followup to the last update, we’ve posted a few YouTube videos that you can follow along with in order to better familiarize yourself with Fairytale Games: Battle Royale, and more specifically the Demo Kit. The tutorials utilize the demo kit and discuss the components (part1), battle (part2), and the overall setup of the game. In part3 we do a Solo Game walkthrough. One VERY important thing to note is that this is not the entire game, but just the demo kit. As well… after watching them, we also understand that we are boring, monotone and obviously have no hope as broadcast journalist talents or an acting career. So…. instead of entertaining you, the videos do more of informing you through the rambling and hacking/coughing from our speaker having the flu. While that’s going on, we’re working with the print manufacture to get Battle Royale ready (we’re going through a few layout revisions again to meet the printer’s needs.) As well, there were a few backer refunds from created cards that we need to replace in the core edition with new cards, or with backer cards that initially wanted to be in the core edition but couldn’t because of space limitations. I’m super excited to get that ball rolling in hyperspeed. Other items that are finalizing are art books and some of our spinoff items.